Titian painted Portrait of a Lady in White around 1561. She's captivated historians and art lovers for centuries — but nobody knows who she is. A mysterious young woman has come from abroad and taken up residence in Pasadena, Calif. She wears a white satin dress, pearls and a ruby ring and has a slight smile — and nobody knows who she is. In letters, the Venetian Renaissance master Titian referred to the elegant woman as his "most precious being" and the "mistress of my soul." But he never named the subject of his 1561 painting Portrait of a Lady in White. The artwork is on loan from the Gemäldegalerie Alte Meister in Dresden. Carol Togneri, senior curator at the Norton Simon museum, where the painting is on view until the end of March, walks us through a few theories about who this captivating woman might have been. Was she a romantic partner? "If this is Titian's mistress, and he's in his mid 70s, there's a big age gap there," Togneri says. "While we know Titian loved his women, one would question whether Titian at the ripe old age of 75 would have such a beguiling mistress." Perhaps there are clues in her jewels and clothes? "Venetian women were known throughout the world as being well-dressed — sumptuously dressed — and taken care of," Togneri says. But the Venetian state passed sumptuary laws that made extravagance a no-no. "Women could not walk around showing all their jewelry," Togneri explains, and "certainly prostitutes were not allowed to wear any jewelry outside of the brothel." So how does this young beauty get away with wearing these luxurious things? Could she be a bride? Possibly. There's been some speculation that the white dress is a bridal dress, but (and there's always a but!) Togneri says that's a puzzle because her blonde hair is fashioned into a bun. "A bride generally wore her hair down," Togneri explains. "It's only as a married woman that her hair would be pulled back into a bun." One thought is that she's a bride who just got married. Was she a daughter? Or a wife? Titian had two daughters and two wives. It's possible that Titian's portrait depicts a daughter on her wedding day, but the timing doesn't quite make sense. The elder, Lavinia, had already been married for six years before the 1561 portrait was painted and Emilia didn't get married until 1568. As for the wife theory, Togneri is skeptical. "His wives generally do not play a major part in Titian's life," she says. So did he just make her up? The Lady in White might not be a real person at all, but rather Titian's version of the 16th century ideal of beauty in Venice. Togneri is always impressed by just how much people need to know who she is. "It is remarkable to me how much we want to hang a name on this portrait — and any portrait that captures our hearts or our souls or our curiosity," she says. She is surprised by our need to link a personality to "paint on canvas." The curator believes that this mystery will, someday, be solved. She says maybe in 50 years, maybe in 100 — someone will find a diary entry, or a payment record, or a letter, and the lady's identity will be revealed once and for all. A mysterious young woman has come from abroad to take up residence in Pasadena, Calif., for a while. She is elegant in a long, white, satin dress. She's rich - real pearl earrings, a necklace, other jewels. Nobody knows who she is, though. 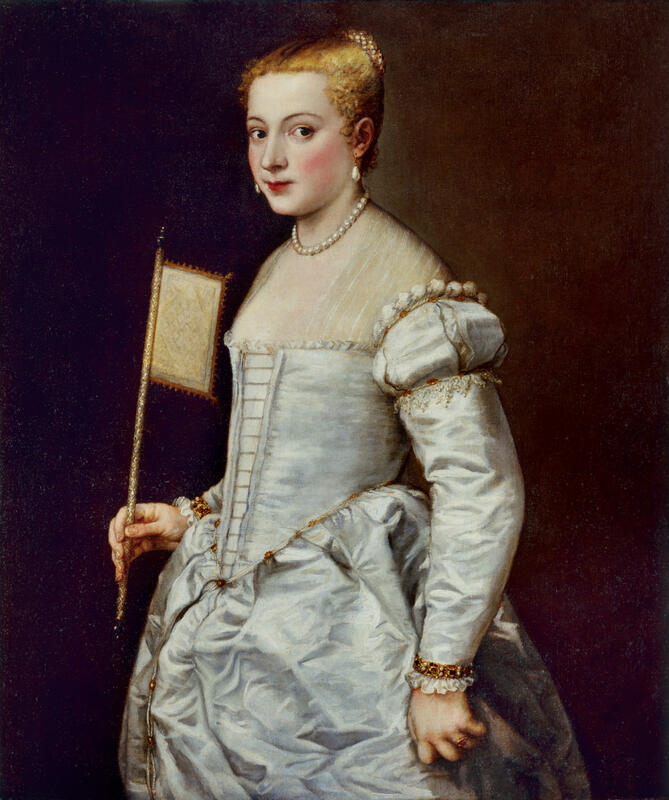 NPR special correspondent Susan Stamberg says, in his 1561 "Portrait Of A Lady In White," Titian - the Venetian Renaissance master - may have painted one of his daughters, a prostitute, or his mistress. SUSAN STAMBERG, BYLINE: In letters, Titian called the young woman my most cherished possession and the absolute mistress of my soul - but he never named her. Her face gives few clues. What do you see in her face? UNIDENTIFIED PERSON #2: Doesn't quite trust whoever she's looking at. UNIDENTIFIED PERSON #3: Hesitant, sort of shy. STAMBERG: But who is she? I went for professional advice. UNIDENTIFIED PERSON #5: Good morning. This is Tristar Investigations. STAMBERG: Bruce Robertson founded Tristar 35 years ago. He knows his way around a mystery. In the 16th century, to identify Titian's lady in white, Bruce says he'd be doing lots of the same things he does today. ROBERTSON: Pasta, there you go (laughter). STAMBERG: Bruce looks for clues in clothing and jewelry - the lady in white's good pearls, her ruby ring. ROBERTSON: Well, it looks like there could be a wedding ring. That would be the left hand. STAMBERG: Oh, look at that. ROBERTSON: So if it was his mistress, it'd even be more scandalous. STAMBERG: Carol Togneri, senior curator at the Norton Simon Museum. The Titian is on loan there through late March, borrowed from an unpronounceable museum in Dresden. TOGNERI: One has to keep in mind that if this is Titian's mistress, and he's in his mid-70s, there's a big age gap there. And while we know that Titian loved his women, one would question whether Titian, at the ripe old age of 75, would have such a beguiling mistress. STAMBERG: Or he could have been an old guy having a really good time. TOGNERI: Yeah, that too (laughter). STAMBERG: Mistress? Probably not. So daughter, prostitute, model maybe. The unidentified lady in white is lovely. TOGNERI: A vision in white. STAMBERG: The gorgeous white dress, the jewelry - Curator Carol has an historian's take on it, different from the gumshoes. TOGNERI: Venetian women were known throughout the world as being well-dressed - sumptuously dressed - and taken care of, even though there were sumptuary laws established by the Venetian state that women could not walk around showing all their jewelry. Certainly, prostitutes were not allowed to wear any jewelry outside of the brothel. STAMBERG: So that maybe rules out her being a prostitute, but nobody was supposed to show off jewels then. Extravagance was a no-no. And this young woman wears them with her white dress, which leads to another theory. TOGNERI: There have been some thoughts that it might be a bride's dress - a bridal dress. STAMBERG: But - there's always a but - Carol says that's a puzzle because her blonde hair is fashioned into a bun. TOGNERI: A bride generally wore her hair down. And it's only as a married woman that her hair would be pulled back into a bun. So what does that tell us? Is she a bride that was just married? STAMBERG: Well, if she was one of Titian's daughters, the eldest - Lavinia - had already been married for six years before the 1561 portrait was painted. And Amelia didn't get married until 1568. How about one of Titian's two wives? TOGNERI: His wives generally did not play a major part in Titian's life, or at least what's come down to us through the archives. TOGNERI: In years to come - maybe 50 years, maybe a hundred years - somehow, someone is going to find an entry in a diary, who saw this when it was on Titian's easel in his studio being painted. Or somebody's going to find a payment book where he does give it a name, and we'll find out who she was. STAMBERG: You can just imagine the world's Italian Renaissance experts making little whoops in celebration. TOGNERI: It is remarkable to me how much we want to hang a name on this portrait and any portrait that captures our hearts or our souls or our curiosity - how much we want to lay on a personality to something that is paint on canvas. STAMBERG: At the Norton Simon Museum, and still puzzled in Pasadena, I'm Susan Stamberg, NPR News. Transcript provided by NPR, Copyright NPR.